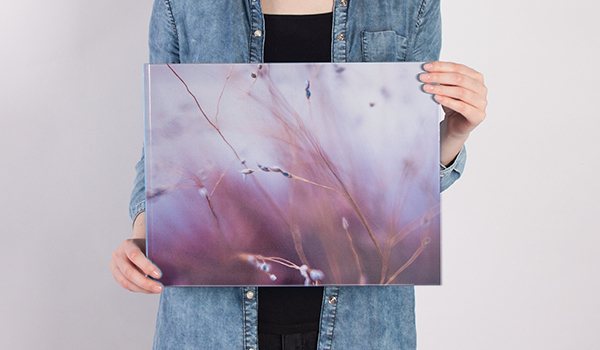 Give your albums the personal touch with a customised photo book cover from bonusprint. You can use your own images to create a unique album cover, then personalise the rest of your book any way you like. Here’s how to get started and order online. Give your photo book a special finishing touch with a personalised album cover. With our range of options, you can carry the theme of your photo book from the front cover to the back. To give a wedding album a traditional look, why not go for a high-quality faux leather cover? And to create a Christmassy album, you could pick a vibrant red linen cover. You can also personalise the front cover of your albums with a title. But for a book that’s even more personal, why not create a custom photo album cover with your own images? It’s so easy to design your own photo album cover. You can add images to all of our hard and softcover designs, from extra-large coffee table books to medium-sized albums. Once you’ve selected the size and format you want, you can create your custom photo book cover using our creator tool. You can upload images to fit our suggested layouts. And for a really impressive cover design, you can wrap one large image around your photo album by resizing it to fit the front and back. Ready to order your custom photo book? When you’re happy with the cover design of your photo book, you can add a title, and maybe even write a blurb for the back cover. There are loads of great fonts to choose from too, so you’ll find the right style to match your theme. The next step is to click ‘add to basket’. If you’ve chosen not to customise the cover with an image, you can select which material to bind your book in and add a title at this stage. Then simply place your order and get ready for your photo book to arrive in the post. First rate photo books with efficient delivery and secure packaging. I wouldn't use any other company for photo books!